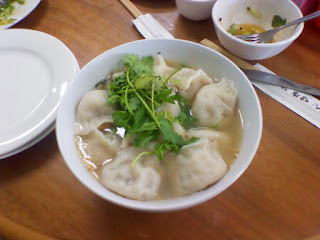 We popped in to 1+1 Dumpling Noodles on our way back from watching some One Africa at the Footscray Art centre. 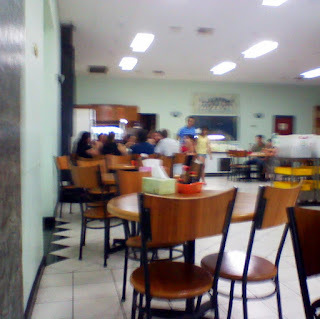 The décor is pretty basic, white tiled floor, painted walls and mostly small tables running up each side. 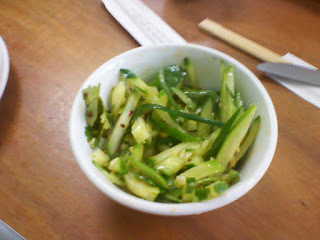 We shared a cucumber, coriander and chilli salad to start. It was fresh and tangy, and the spice certainly built up over a few mouthfuls! 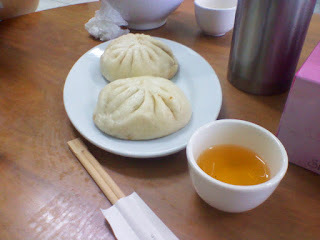 We also had a pork bun each, the waiter called them pig buns when he came to add up the bill! These were a decent size, and both the roll and the meat were well flavoured and cooked. 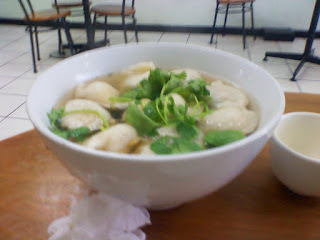 The seafood dumpling soup was packed with dumplings! Which were apparently very good. I had the lamb dumpling soup, a first for me I think. The soup was again packed with dumplings, which were decently sized too, the broth was fairly basic, but did contain lots of tiny shrimps and some seaweed. I managed to get through the soup, just! It was too good to leave any! All up the bill came to $27 for both of us, great value! I'm going here Wednesday - looking forward to trying it! Thanks for the review. $27 for two, what a steal!